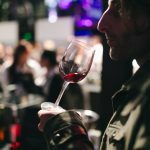 To anyone familiar with the reds of Bordeaux or the Veneto region of Italy, Argentine reds boast a unique colour: from the moment it splashes into the glass, the first thing you notice is its intensity — a dark violet red, like the night — a dense colour that you cannot see through. And that intensity is key. We should make it clear, in case there are any doubts, that this colour is a factor of quality, perhaps not technical, but more for consumer appreciation. It is, so to speak, a sort of positive bias, and that the greater the concentration of colour, the more prepared the palate is for a robust red, while in the opposite case the mouth expects the gentleness of light reds. This is not always true, but it serves as a guide for the less trained consumer. 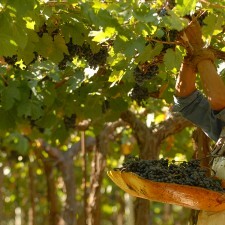 So why are Argentine reds so red? We shall explain. If we think that the colour of the grape acts as a protective layer to the seeds, against external agents such as the burning rays of the sun, their emergence is closely linked to physical and chemical factors. In short, it operates as a polariser, which absorbs UV rays and protects the embryo within the seed. 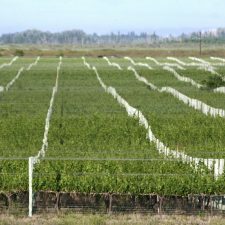 In the case of the Argentine reds, the reason for their intensity is to be found in a handful of factors linked to the type of terroir. On one hand, they all are located in arid zones, where the sun shines more than three hundred days a year. On the other, the height of the vineyards, which provides a more ethereal air and at the same time a thinner filter for UV rays. There is another element, however: in the desert, the nights are cold and that is when the plants rest and the colour molecules are produced in the grapes. 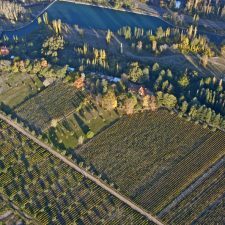 How these factors of terroir operate are as explained below. The colour of the wine is the product of colour pigments from the grape, known as flavonoids. In white wines, these are called flavones, while in red wines, anthocyanins. Both form part of the extensive family of polyphenols, in the skin of the grape and, to a lesser extent in the pulp. 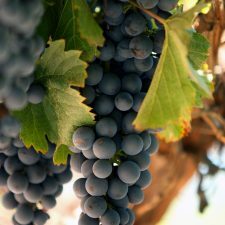 Of course, the colour, as well as being associated with the terroir, depends on the variety of the grape: so, the anthocyanins present in a Cabernet Sauvignon or a Merlot tend to be red, while in Malbec, they are violet. And between them, a whole spectrum of possible nuances. 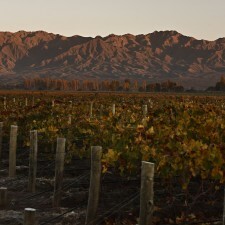 This tone, however, increases in intensity according to whether the terroir receives a lot of sun or is cloudy. 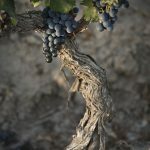 A Merlot from Pomerol, France, has less colour than one of Agrelo, Mendoza. And therefore, altitude and sun are determining factors. The rule is: a bright area gives wines of intense colours, while vineyards in cold and less sunny climates provide lighter coloured wines. However, there are two interesting exceptions to note. 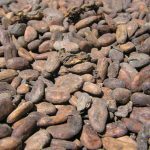 One is that in warm areas, with no thermal amplitude, where the plant can’t halt its transpiration at night, it consumes its polyphenols. The result is wines which are weak in colour, as in the central valleys of San Juan and in the East of Mendoza, in Argentina. The other key factor is the acidity of the grape. In wines of moderate to low acidity, the colour tends to be less bright and veers towards brick and tile tones, even when their base colour is red. 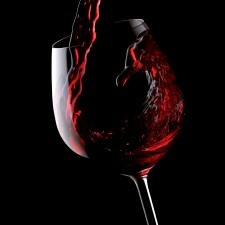 In wine with high acidity, the dominant tone is brightness and well-marked reds and violets. An example of this can be seen with tea: while freshly infused tea is dark, when you add a few drops of lemon, it turns to a lighter amber. The same applies to wine, minus the lemon. 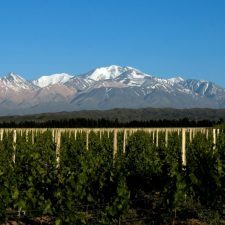 Cultivated throughout Argentina, Malbec offers an ideal example to understand how a terroir operates in defining the colour of a wine. 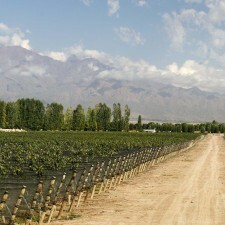 In Mendoza, where it is grown between 800 and 1,400 meters, it develops a purplish red colour, whereas, in lower-lying areas the hue will be redder. So the higher it is grown the more violet the colour becomes and the lower, the more red. High up in the Valles Calchaquíes in the northwest, between 1,700 and 2,500 meters above sea level, the colour is dark violet, opaque and almost black. In this area, the sun is more intense and the wine has less acidity. In colder terroirs, further south in Patagonia, where it is grown at around 300m.a.s.l, the colour is purple and lively and very bright. Here the concentration is provided by a thicker skin which the fruit develops to protect it against the strong winds in the region. Whatever the origin, one thing is certain when it comes to pondering on the colour of an Argentine wine: it will almost always be impossible to see right through the glass. The unmistakable mark of a bright and sunny terroir and of its counterpart, cold, dark nights concentrated in the glass. 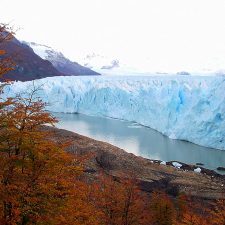 ...What are the most typical pairings in Argentina?